Home Depot now has EcoSmart 40 watt equivalent LED bulbs in-store. Having a light output of 440 lumens, these are 8 watt devices with a standard A19 profile. They are also manufactured by Florida based Lighting Science Group through an exclusive resale agreement with HD. There’s an interesting story here too. LSG’s research showed that automation would be key to producing a light that can reliably last 20 years, so they eschewed the standard Chinese manufacturing route (which achieves cost savings through the use of cheap manual labor) in favor of a local facility featuring high automation for an exact construction process. The result: LSG’s strategy massively undercuts Philips/Sylvania (who use Chinese manufacturing) in per-unit pricing while also producing what is arguably a more reliable device to boot. 20 years is a long time for any daily electronic device to run, so this is a good thing! The other big deal to this strategy is here: LSG is building a large manufacturing facility in Florida and will be hiring 800 people to ramp up construction of this device as well as their 60 watt equivalent bulb due out soon. Kudos to them for this! This is how American industry needs to be thinking! Anyway, I had known that the 40 watt equiv bulb was available online since August with in-store availability planned for September, so while we were in the store looking at water efficient toilets, I strolled over to the lighting section to check and there they were. Since we have many 9 watt CFLs in the house that are also 40 watt equivalent, I quickly purchased one for $20 and brought it home to test. Folks, I can now say with conviction that the world of lighting has changed. I was so impressed with the results that I ran back over to HD and purchased 4 more. We now have the master bathroom completely switched over to LED lighting (3 light “tulip” fixture above the sink) along with a 2 fixture floor lamp in the living room. 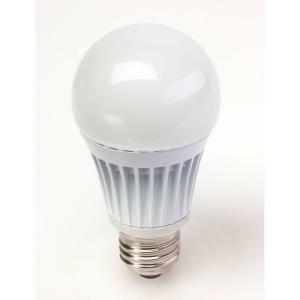 Unlike dimmable CFLs which only dim down to about 30% or so before they begin to flicker badly, these lights can dim down to 1%, just like their incandescent counterparts. At 3000K these lamps are a bit less yellow than a traditional 2700K bulb but in the bathroom this is actually an advantage. I like them in the living room floor lamp as well since this light is primarily used for reading purposes. There just aren’t a lot of disadvantages to this light bulb. The only difference is that very little light is thrown towards the screw in connector. This is due to the fact that the heat sink for the LEDs themselves is located on this side of the bulb. Consequently, light is projected a little more than 180 degrees, from one side of the bulb to the other. These lights would therefore work best in fixtures that point the bulbs downward or horizontally.